It’s the Tuesday of OCD Conference week, and I’m excited to be hosting someone you’ll have a chance to meet, learn from, and be inspired by this weekend. Sean has taken huge leaps in his recovery in the past few years, moving out of his dad’s house to residential treatment in Boston to living on his own and taking life by the horns—working full-time, pursuing art, and not taking anything for granted. I love his take on mindfulness, self-compassion, and personal growth, and I think you will, too. Like so many other people with OCD, it took years before you realized what was really going on. You were diagnosed in 2012, but you’d had symptoms long before that. How far back do you remember having obsessions? I remember having obsessions all the way back to when I was 10 years old, maybe younger. I worried constantly about my mother’s health and global warming! What led you to finally seek help and get a diagnosis? The spring after I turned 32, I had gotten to the point where I was everything but catatonic. I couldn’t leave my chair, my room, my house. I would stay still for hours locked in obsessions, ritualizing to get out of them. During any periods of rational thought or normalcy (I jokingly called these times my “awakenings,” a term I took from a Robin Williams movie I enjoy), I would either ponder suicide or fantasize about finding a magic cure. I finally succumbed to my very really desire to live, and asked my dad for help. I didn’t know what to do, but I knew that I had to do something, anything. We eventually made an appointment for an intensive two-day neuropsych evaluation at the Lindner Center of Hope near Cincinnati, Ohio, about 120 miles away. Once you knew it was OCD, how did you feel? Were you comfortable sharing your diagnosis with loved ones? Honestly, I didn’t have much of a reaction, I had done research and knew what OCD was and even kinda self-diagnosed myself in high school after watching a daytime talk show from the ’90s with a kid on it with OCD. What was really going through my head was: A) OK, now what, I have an official diagnosis, there is no way I can afford therapy, and it probably won’t work anyway. B) I hope my dad now understands that all my failures weren’t all my fault and C) They missed something, I have something worse, I’m psychotic, they don’t know what is really wrong with me (this was my OCD talking). I am fortunate with the friends and family I had when I was first diagnosed, so talking to my close loved ones was not a problem and I received a lot of support from them. It was the community outside my inner circle that I always felt awkward or shameful around. As my confidence grew and as I got better and better, I became more at ease talking about my struggles with more and more people. I really do like the chance to compassionately teach someone about OCD and mental health awareness if they are having a hard time understanding it. You eventually went to residential treatment at McLean in Boston. How did you decide to take this step? I had told myself when I first started down my path of healing, that I would do whatever it takes to get better. So there was no way I was going to take a recommendation from an OCD expert home with me and just sit on it. I was really open to any suggestions of treatment and had mentally prepared myself for treatment. With the initial formal diagnosis from Dr. Charles Brady at the Lindner Center, we were told that my case was so severe that even the Lindner Center’s own OCD residential program was probably not enough and that I would most likely need a more intensive, longer stay at a larger hospital. When my dad and I were suggested some programs that were known nationally, we began to do some research. We finally came to the decision for me to attend the OCDI at McLean Hospital in Boston, Massachusetts. Again, for me, the decision to get intensive treatment was not all that hard to make. I was really scared, I was filled with uncertainties as you could probably guess, but I had been through so much, I was at my worst, I was willing to do anything to get my life back. Residential treatment can be really beneficial for some people, but it can also be difficult to transition back to daily life. How did you maintain the progress you’d made after you left McLean? One of the hardest things that I have had to do, and I assume that this is hard for other “warriors” (term I use for those on the path of healing), is planning to discharge from a residential facility (sometimes called aftercare work), and then transitioning from residential life to the realities of the real world. The recipe for maintaining progress is a very complicated, multi-layered, and subjective experience for each resident. I attended the OCDI twice, once in 2012 and then again for the winter of 2014-15. Each stay, in my eyes, was completely successful, and changed my life in its own unique way. The first stay, my team and I really focused on getting myself mobile again by attacking the obvious, more visible rituals I was struggling with. The second stay, my team really got me acquainted with acceptance and commitment therapy (ACT) and mindfulness on a more personal level and I got a chance to do a lot more expressive art therapy. By doing this, I was able to give more to the existential, big picture and personality-driven obsessions that I was really struggling with at my core. So, with that being said, I had two different experiences transitioning to the real world. The first time I left residential treatment I had come a long way in my therapy. However, due to not having the proper resources in my hometown and having some life curve balls thrown at me, the issues that my team and I were not able to address during the first stay escalated and got worse. The real story, though, is how I handled the transition my second time around. This time, I was dead set on doing well outside of treatment and I set myself up to do so. In addition to the exposure and response prevention (ERP), ACT, and mindfulness therapy I received at the OCDI, I really started working on my systematic problems with “perfectionism” and self-confidence. I began to view my thoughts in different ways and I started to allow myself to become less rigid in how I achieved my goals. By ditching the “fixed” mindset I had carried with me most of my life, and by developing a “growth” mindset, I was able to keep the momentum I had built during therapy and continue to heal while navigating the peaks and valleys of real life. In my case, my ultimate exposure was indeed life. So, in order to really transition well and grow the way that I needed to, I had to make some tough decisions. I had to expose myself to taking risks and living life on my own. I knew that the only way that I was going to grow and become wise was to have the life experiences therapy had prepared me for. It made no sense to get therapy and then avoid my fears by going back to the same situation that I was in. So, the last two weeks of my residential stay, I started to look for people who wanted to sub-lease their apartment in the dead of winter. I applied to over 20 places for employment, and I was adamant about keeping my behavioral therapist that had helped me so much. The therapy part was very important to me because I had grown tired of dealing with BTs who were sub-par or who did not understand my case. I felt I deserved better, and this was the only area I stayed pretty rigid on. So, by the last day of my treatment I had found an apartment, I got a low-level part-time job, and I had my therapist. On March 1, 2015, I had officially moved from Ohio to Boston. In order to make this transition work, I decided that I had to make promises to myself and then actually keep them. I knew that I wanted to fill my calendar and stay busy because I knew that if I was bored or static I could start getting back into my head. I promised myself to work 40 hours a week, and I did. I promised myself I wouldn’t miss any therapy appointments, and I didn’t. I promised myself I would volunteer, and I did, and then I promised myself I would take my art to new levels, and I did. I kept pushing myself to do the things that were valuable to me and that would be productive in my life. I quit drinking and I started to save my money. I attended meet-ups and even ran a figurative art night. I attempted art projects that I would have initially avoided, and I continually set daily and weekly goals for myself. In general, I knew that I had big-picture ideas, but the only way that I was going achieve anything was to take small baby steps and build a path of confidence filled with small victories and lessons learned by mistakes. By adhering to this philosophy I was able to overcome setbacks more easily and calm down quicker when I panicked about not being able to handle what I had gotten myself into. As I progressed, I noticed that the valleys became less deep and the peaks were more attainable. Transitioning can be tough, but by continuing to hold yourself accountable, the life you want can be within your reach. I would like to add, though, that my transition was really made possible by my support team, which includes my family, close friends, and therapists. I have been very fortunate with that. You once told me that ERP is great, but you found ACT to be even more helpful. Tell us more about that. How does ACT work? ERP really helped throughout the entirety of my therapy; however, what has really made a significant impact on the core of my thought processes has been ACT. ACT is a therapeutic model based on mindfulness and Eastern philosophies, and it has really challenged me to change the perspectives I’ve had on my thoughts. Instead of struggling with my thoughts and negative emotions I learned that I had the power to give them meaning. I learned that I could have compassion for these thoughts and view them as exactly what they were, just thoughts entering and exiting my mind. I started to allow them space by using a technique called “expansion” and I started to not judge them by ceasing to give them attention. ACT has really helped with my own self-confidence and has really allowed me to make strides in my own personal growth. We’re presenting together at the OCD Conference, on a panel about taboo intrusive thoughts. I’ve had other types of obsessions, but I found the taboo thoughts the hardest to get over. What can you tell us about your intrusive thoughts and how you’ve handled them? I have struggled with intrusive thoughts my entire life and they probably started before I was even a teenager. The content of my intrusive thoughts has changed and evolved throughout the years but has primarily been centered around harm, sexual deviance, homosexuality, scrupulosity, and fears that I may be a sociopath. For twenty-two years, as you may have guessed, I handled the thoughts the only way I knew how, and that was to perform physical and mental rituals or to just flat out avoid certain situations. But as I have gone through therapy, I have been able to view my thoughts in a different way: I am not my thoughts. I have the power to give my thoughts meaning. Everyone has these thoughts and because I’m human, I have these thoughts. What also has had a large impact on me is being part of a community that has had the courage to stand up and talk about their experiences with this disorder, which, in turn, has allowed me to feel welcome and warm and supported and above all else, not alone. You’re holding an art event at the OCD Conference,on Friday night, called Draw Your Monster. Why should conference attendees come to this activity? What can they expect? Remember your “Big Picture.” Embrace uncertainty. Open your mind to the “grays” in life as there is no back and white. Remember that you are not alone. Don’t be afraid to ask for help. Be open with your thoughts and emotions. Remember to treat yourself well. Notice that you are human. Do research and ask questions. Force yourself to stay present. Be compassionate. Take risks. Accept love. That obviously isn’t just one, but all need to be said. Since I have OCD myself, I’m not the target audience of When a Family Member Has OCD: Mindfulness & Cognitive Behavioral Skills to Help Families Affected by Obsessive-Compulsive Disorder (New Harbinger Publications, December 2015) by Jon Hershfield. Loved ones are. That said, I highly recommend this book for both family members and individuals with OCD. Consider now that what you may have felt for that moment is what your family member with OCD feels on a regular basis—anywhere from one hour a day (the OCD diagnostic minimum) to not just every waking moment but also in his dreams. Wow. This is why this book is so important for loved ones to read — an essentially neutral third party is helping them put themselves in a sufferer’s shoes, without any of the history or baggage of the relationship. 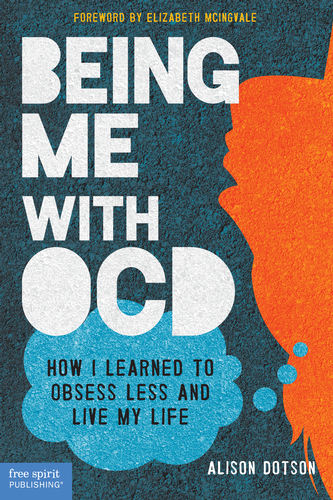 You’ll also find Mindfulness Tips peppered throughout the book, and each chapter of parts 1 and 2 ends with two sidebars, Consider This, which helps the reader see obsessions and compulsions through his loved one’s eyes, and Your Struggle, which pinpoints how OCD affects the reader as well as the sufferer. Hershfield is an expert OCD therapist who gets what his patients go through, but he acknowledges — again and again — how difficult OCD is for the reader, the family member. And with this in mind, he offers concrete tips for not only helping people with OCD cope, but also their loved ones. What should you do, for example, when your spouse asks you to check to make sure the stove is off? Are you helping by taking over this compulsion, or are you hurting? (Spoiler: You’re not helping.) Hershfield feels compassion for everyone in the OCD cycle, and it shows. While the book is organized in such a way that you can hop around and read a section here and a section there, Hershfield recommends that you read it from beginning to end — and I agree with this recommendation. You may come across a tip in Part 2 that will make more sense if you’ve read Part 1, and you don’t have to page back through trying to find an explanation you’d otherwise already have. And it’s a joy to read! I know I’m a little biased in that I have OCD and consider it an interesting topic, but Hershfield is so engaging you’ll be pulled in and will want to soak up all of his wisdom.